As a plate umpire, you are embodying the image everyone thinks of when they think of an umpire. It is important to remember that you will generally have at least one partner when you are on the field, so keeping your partner in the game is a big part of the plate umpire's responsibility. If you are just starting to learn the plate, this is a great place to start. This training will give you the fundamentals required to becoming a strong consistent plate umpire. 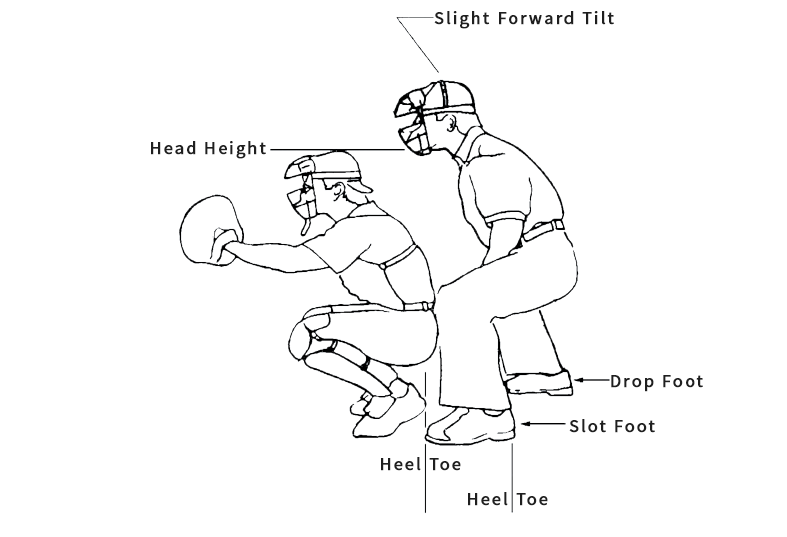 Most people find home plate to be more challenging given the constant scrutiny of each pitch and the physical demands of crouching behind the catcher to call balls and strikes. In some respects, it is easier to stay focused on each play when you are situated behind the plate. Each pitch requires your undivided attention. One important thing to keep in mind as you expand your umpiring knowledge to the plate is that you will still have a senior UIC on the field with you whiule you are a Level 2 umpire. PHBA believes you will have enough new information to focus on as a beginning plate umpire as well as learning to be comfortable in your new gear. Just as it is for Level 1 umpires, the UIC will continue to address the coaches challenges and will conference separately with you as necessary. The goal is to get you comfortable and ready to progress to Level 3! This strategy is based on an established, simplified approach to base umpiring that is well suited for beginning umpires and is consistent with more advanced approaches used by veteran PHBA umpires. Review the topics on this page and you'll be on your way to umpiring behind the plate like a pro! The umpire lines up, in the slot between the batter and the catcher, about 6-10 inches behind the catcher positioning his head so that his chin is no lower than the top of the catcher's head. The umpire's feet should be in a staggered position, a bit wider than shoulder width. You want to make sure you have a clear view of the outside corner of the plate, as well as the proper angle to see the low strike. Given the extent to which the modern strike pitching "lives low," it is important to have a clear view of the bottom of the strike zone. It is important to keep in mind that knowing the proper position is good, but nothing beats on-hand directed instruction and in game experience. One of the most important concept to grasp when getting behind the plate is to track the ball from the moment it leaves the pitches hand until it is hit or is caught by the catcher. Keep your head still. The ball is moving and it will be much more difficult to track if your head is also moving. It can be tempting to move your head as the ball approaches the plate directly at your head. You will need to trust the catcher will catch the ball. 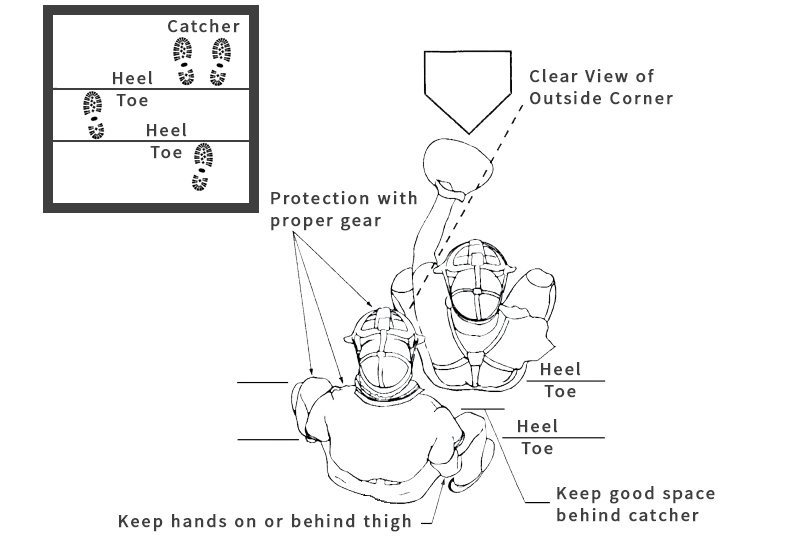 If the ball is missed or tipped by the batter, you will need to trust your equipment to protect you. If you start moving your head, you will not see the pitch cross the plate. You will also need to practice tracking the ball with your eyes. This is tricky as you will be tempted to move your head as the ball tracks toward the outisde of the plate. It is important to keep your head still so your angles do not change, which can cause errors in perception. Some pitches are just more challenging to see. The High-Outside part of the strike zone and the Low-Outside part of the strike zone are tough to see for the most exprerienced umpires. The only real answer to this is to be consistent and put in the time. The more game experience you get, the more natural seeing, and calling, the outer half of the strike zone will become. Seeing the ball hit the catcher's mitt, pausing, and making the call is the most difficult thing to do. Proper timing will not only go a long way to earn the trust and confidence of the managers, coaches, and fans, it is the best way for avoid making mistakes by calling the pitch too quickly. The most common gripe we hear during a game is about the strike zone. Wikipedia defines the strike zone as "...the volume of space through which a pitch must pass in order to count as a strike (if the batter does not swing). The strike zone is defined as the volume of space above home plate and between the batter's knees and the midpoint of their torso." Knowing the strike zone as it is defined is important, but being consistent in how you apply the strike zone in a given game is critical. As you can see, the Baseball strike zone definition has changed a lot over the last 67 years. You can imagine the amount of fans who still think it is defined as it was when they were learning the game. 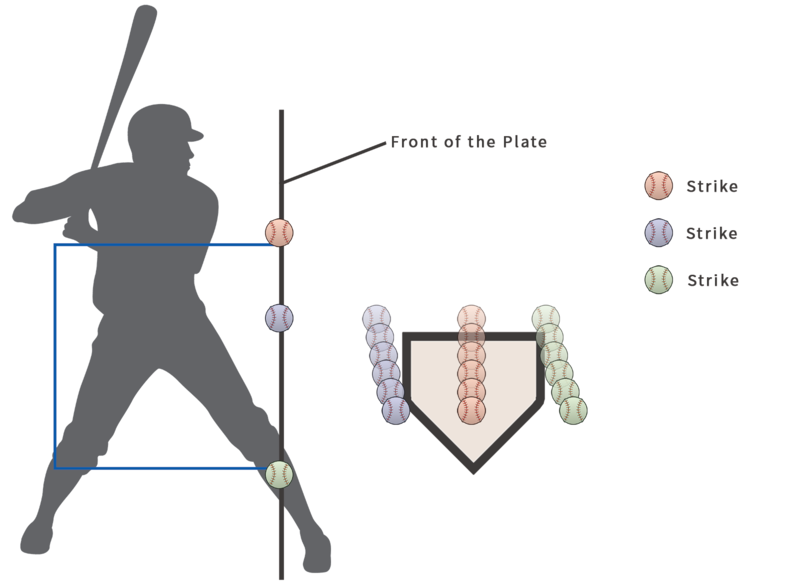 Keep in mind, every part of the plate is in the strike zone. 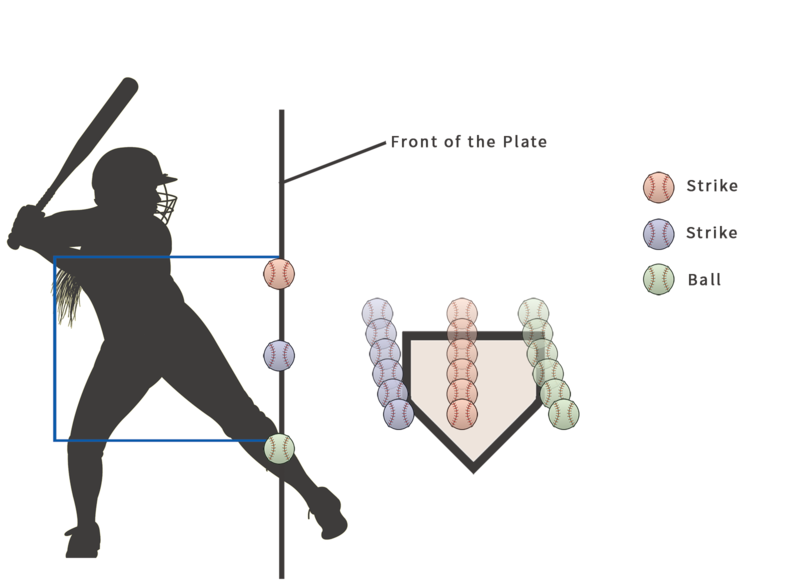 This means the ball can miss the front of the plate and still be a strike...Diagram 3 demonstrates a couple examples of this. The best thing to do is to not get too excited over the comments from the fans and coaches; just call balls and strikes as you see them. You might be the only one on the field who knows the absolute definition of the strike zone, maintaining consistency crucial to your success. For softball, the strike zone is a bit different. 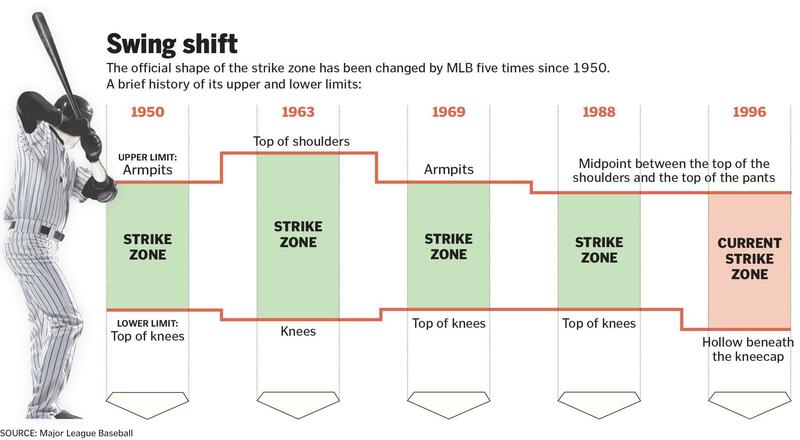 When reviewing the Baseball strike zone history in Diagram 2, reference the strike zone in 1950 for the current Softball strike zone. Another key difference here is that the entire ball should be in the strike zone when the ball crosses the plate.